Queen Victoria was so enamored of the Scottish landscape that she and Prince Albert purchased a Scottish residence, Balmoral Castle, in 1852. The royal family soon adopted Highland dress in the form of tartans and jewelry. Such jewelry came from the land itself, often called “Scotch pebbles”, from the use of native hardstones. 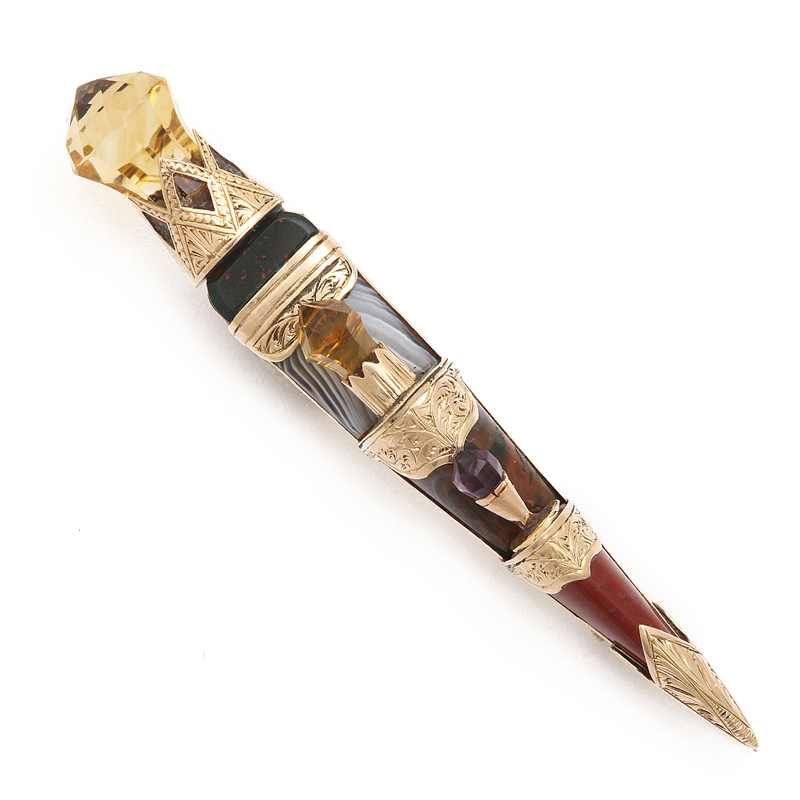 Commonly used stones, often mounted in silver, included bloodstone, carnelian, polished agate and granite, citrine, garnet, pale amethyst, and jasper. Cairngorm, a smoky yellow quartz, from the Cairngorm Mountains, was the most favored stone. Brooches were among the most popular forms of Scottish jewelry. The Scottish dirk, or dagger, was a recurring design motif, evidenced by our sgian dubh brooch, covered in a previous blog post. Other common designs included the Saint Andrew’s cross, butterflies, anchors, and love knots. Circles were also common, like our agate, bloodstone, and citrine open ring, or penannular, stick pin (pictured above). 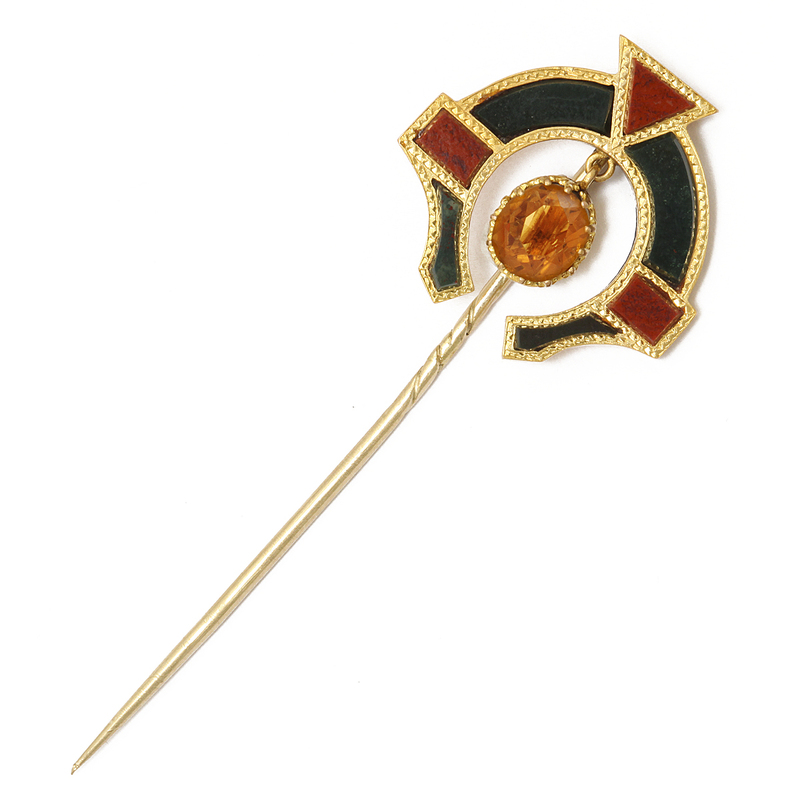 Our stickpin is an abstraction of the generic Scottish-ring brooch, which usually featured a pinhead in the form of a thistle. Such brooches are inspired from the penannular brooches with thistle-headed pins of the Viking period (793-1066) found in Ireland and Scotland, and were used to fasten garments. In the Victorian age, Scottish jewelry was often worn with tartan costumes for ice skating. In our own age, they are suited for everyday wear, no matter your intended activity (or lack of plaid).